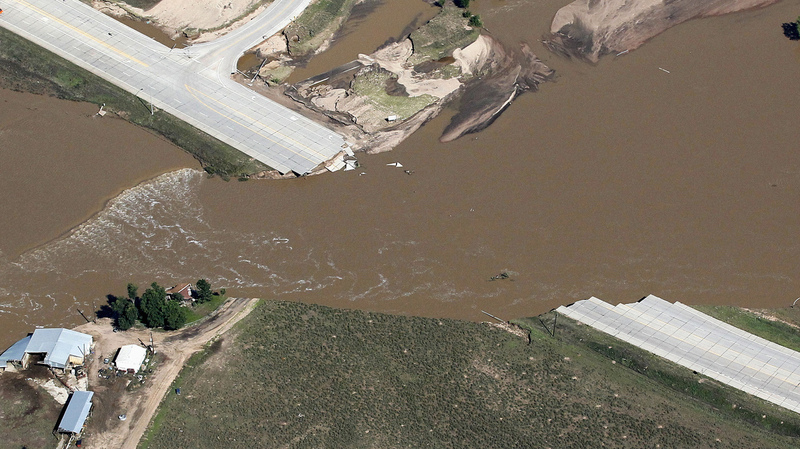 As Colorado Floodwaters Recede The Damage Becomes Clear : The Two-Way Skies have cleared and the worst may be over. But as the water goes down, the destroyed roads, homes and businesses are emerging. Piles of debris line canyons. A view from the air Tuesday of one of the roads that have been cut by floodwaters in Weld County, Colo.
"For the first time since Colorado's historic flooding began last week, nature gave residents and rescuers a rain-free day, allowing emergency crews to bring help to stranded people and helicopters to ferry the willing to safety. "Thousands of people across a broad swath of the Front Range were still kept out of their homes — or trapped in them — by floodwaters." "Across Colorado's 17 flood impacted counties there are currently 12,118 people evacuated and 306 unaccounted for, the state's Office of Emergency Management reported Tuesday night. There are 6 confirmed fatalities, and 2 missing and presumed dead in Larimer County. "The 2 persons missing and presumed dead came from Cedar Cove in the Big Thompson Canyon, where the width of the Big Thompson river has grown significantly in some places." What's more, says KUNC's Grace Hood, as the waters recede it's becoming clear that it's going to take a long time and lots of money to repair destroyed roads and replace or repair homes and businesses. As we reported Tuesday, it may cost $500 million or so just to repair roads and highways. Grace posted a Vine video clip of the water and damage along "Highway 34 near the mouth of the Big Thompson Canyon." There, as she writes, "piles of wooden debris laced with flip flops, prescription pill bottles and Styrofoam" clutter the area. KUNC also writes that there's concern about damage that may have been done to the wells in "Colorado's richest oil field."